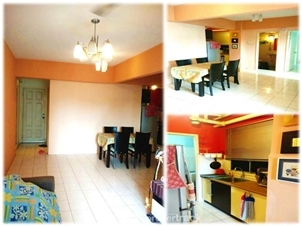 Vista Serdang Apartment Seri Kembangan for Sale Rent - property Malaysia - For Vista Serdang Apartment (Pangsapuri Vista Sedang) at Seri Kembangan Selangor for Sale, Rent, Lease and Sales enquiries, telephone the Property Desk on (+60) 03.2032.3168 / Duty Handphone (+60) 012.697.8178 or simply click on the blue propertrack Malaysia Nilai Harta Consultant Sdn Bhd Contact Agent link below. Pangsapuri Vista Serdang (also known as Vista Serdang Apartment, Condo, Condomimium) is located on Jalan Kasturi off Taman Bukit Serdang within Seri Kembangan neighbouring the matured community and established mixed development of landed residences, walk-up apartments, shop apartments and condominiums in Serdang Raya, Sungai Besi town, Bandar Tun Razak, Seri Petaling, Bukit Jalil and Technology Park Malaysia. The ready to move into fully renovated 806 sq ft apartment, with no further expense spared, is partially furnished comprising of 3 bedrooms with numerous built-ins, 2 bathrooms, a well designed fully fitted kitchen, air conditioning units, ceiling light fixtures, telephone point and Astro / television points coupled with full facilities to include a swimming pool, gymnasium, badminton and tennis court, multipurpose hall, mini market, laundry, playground, allocated covered parking space, 24 hour guarded security and much more. Vista Serdang Apartments are housed within 2 blocks (Block A and B) with 21 storeys respectively. The practical layout of 3 bedrooms and 2 bathrooms with built up area from 806 to 1612 sq ft.
Pangsapuri Vista Serdang, is within a short drive distance to the Mines Shopping Mall, South City Plaza, Jusco Equine Park, Restaurants, Hypermarkets and Education Facilities to include, Alice Smith International School, International College of Health Science (ICHS), SEGI College, Univerity Putra Malaysia (UPM) as well as Serdang Hospital and Bukit Jalil Stadium. Public transport amenities such as Metro bus and RapidKL bus services, the new Bandar Tasik Selatean Integrated Transport Terminal, LRT stations at Sungai Besi and Bandar Tasik Selatan and the Serdang KTM Komuter Station are all being within the radius of 10km. Vista Serdang Apartment is located at the southern part of Kuala Lumpur, affords numerous advantages and easy access to KL City Centre, all parts of Klang Valley and out of state via North-South Highway (PLUS), BERSAYA highway, Shah Alam Expressway (KESAS), Belakong and UPM Interchange, Maju Expressway as well as the KL-Seremban Highway well exit to Putrajaya, Cyberjaya and the KLIA. Renderings and photographs herein may be artist’s impressions only and all measurements are approximate subject to final survey. All indicative prices are subject to change, floor level, view and furnishing (where applicable). PREIS, a wholly owned subsidiary of Asia Move Machine Sdn Bhd (AMM) extends a discreet one-stop property solution for out-right disposals, acquisitions and joint-ventures for our select clients. We pride ourselves in the careful matching of the product with the right parties. Our clients include land and property owners, developers of residential, commercial and industrial products as well as bulk purchasers to include property wholesalers / sales underwriters. AMM is a Member of the British Malaysian Chamber of Commerce (BMCC). Whilst every reasonable care has been taken in preparing this information, Asia Move Machine Sdn Bhd (AMM) its agent, property desk, representative or real estate investment services brand, propertrack, cannot be held responsible for any inaccuracies or changes. E&OE.